Of all the annoyances that come with modern information technology, e-mail spam is perhaps one of the worst. Unsolicited messages have clogged inboxes ever since e-mail became a popular method of communication, and the ramifications go far beyond the time wasted when you delete them. About 9 out of 10 e-mails is considered spam, according to security vendor Symantec Corp. That’s 260 billion spam emails sent every single day. The lion’s share of that spam is sent by botnets, networks of computers that have usually been infected by a trojan virus and are used to send out e-mail messages involuntarily. Spam is used to infect computers with malware, in phishing attempts to steal personal information and money, and to peddle pharmaceutical drugs of questionable quality. Spam is even bad for the environment – McAfee commissioned a study that reported the amount of energy consuemd in transmitting and deleting spam is equivalent to electricity used in 2.4 million U.S. homes, and generates the same greenhouse gases as 3.1 million passenger cars on the road. It’s no wonder that the Canadian government wants to fight back against spam. 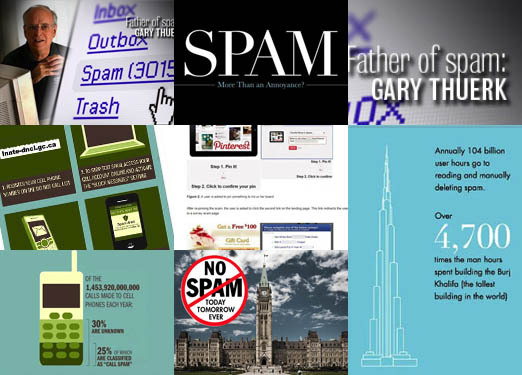 Canada’s Anti-Spam Leglislation passed parliament and received Royal Assent in December 2010. Final regulations for the law were issued March 28, and the enforcement bodies have been identified. The law is set to be put into force in the coming weeks, and Canadian businesses need to adapt their e-mail practices or face stiff penalties. Here is everything you need to know about the new anti-spam law. CRTC issues the regulations that must be followed by businesses sending out any electronic messages. The new rules have been a long time coming. A group of governmental bodies will soon start enforcing the anti-spam law passed by Parliament in 2010. Here’s what you need to do to get ready. Canada’s Bill C-28 is just what the country needs to keep spam-crazy companies in line but a $700,000 spam reporting centre may be nothing more than “window dressing” according to experts. Government bodies charged with enforcing the law are also still working out details of how to coordinate activities. Canada’s new anti-spam law will be among the world’s toughest when it comes into force some time this fall. Lawyers and marketing specialists say Canadian businesses need to understand the law and make some changes in the way they use e-mail to avoid possible fines. Canada now has its own anti-spam law after Bill C-28 was given Royal Assent Dec. 15. Enforced by the CRTC and the Competition Bureau, violators of the law could see fines as high as $1 million for an individual or $10 million for an organization. Understanding how botnets work, looking at spammer strategies, and the lack of enforcement against cybercriminals. Official Web site for Canada’s new anti-spam legislation, which attained Royal Assent in December 2010. A question and answer guide to Canada’s new anti-spam legislation as provided by Industry Canada. Canadian law firm with a business focus offers advice on adapting to Canada’s new anti-spam legislation and information on live education sessions. CASL covers substantially more ground than previous anti-spam legislation in Canada.